Categories: Building Envelope, Contractors, Contractors News, Energy Management, Energy Management News. Keywords: Building Energy Asset Score, DOE. While the tenants and energy usage patterns within a building frequently change, its physical structure and major equipment remain mostly constant. 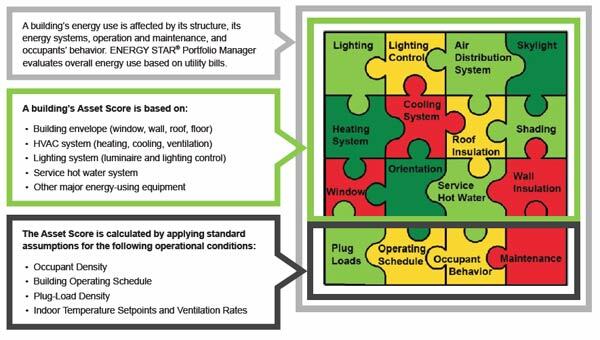 These underlying energy “assets” – such as the building envelope (roof, walls and windows) and lighting, hot water and HVAC systems – have a significant impact on how efficiently energy is used within a building regardless of how the building is operated or the behavior of its occupants. Building owners and third-party management companies can use the Asset Score to guide energy improvements, demonstrate national sustainability leadership and corporate social responsibility, and ensure the market recognizes their investments in building energy efficiency regardless of tenant behavioral impacts. Energy services companies, engineers and green building consultants can leverage the Asset Score to enhance their proprietary services and engage new customers, and integrate their tools seamlessly with the Asset Score through an application programming interface. State and local governments can identify energy cost-saving opportunities in their own portfolios and make that information transparent and accessible to taxpayers. Utilities and utility program administrators can use Asset Score results to identify customers for energy efficiency rebates and help achieve their energy efficiency targets more quickly and cost-effectively. DOE is actively seeking Asset Score users. Individuals or organizations that use, or commit to use, the Asset Score on one or more buildings by spring 2015 will receive national recognition from the DOE Office of Energy Efficiency and Renewable Energy, as well as technical support using the tool. Building owners and managers, energy services providers, architects, engineers, utilities, and other parties are encouraged to participate. For more information, contact Andrew Burr.